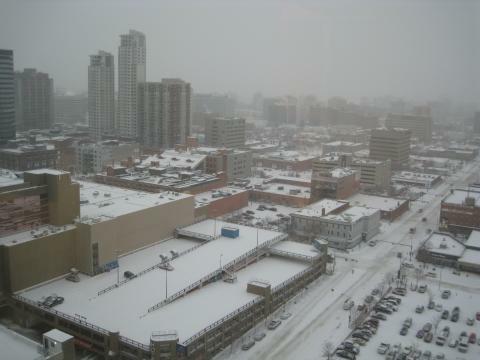 Well People, Winter has offically come to Edmonton, the temp this morning is -28 degrees Celsius and we had between 5 - 10cm of snow yesterday. I think the only ones happy about the snow, are the kids. We are supposed to warm up to -12 today, with some sunshine. Over the weekend they say they are watching for a system from the States and it may give us a bit of snow along the Southern Prairies. So get ready for more snow this weekend. I can tell that this winter will be a very cold and icy one. The road conditions are poor, and people are still driving like it's summer outside. It is supposed to warm up next week into the single digits and hopefully drivers will learn to slow down. Right, who am I kidding, with warmer weather comes more crazy driving. I can honestly say, that I'm looking forward to my winter vacation in the hot hot sun. Thats right, for a few weeks, I'll be sitting on a beach, drinking... water and enjoying the sun. While my friends will be here, dealing with falling snow, cold temperatures and icy road conditions. Well, for right now, I guess I have to throw on my boots, scarf, hat, mittens and heavy winter jacket and grab that shovel. I have to go shovel the driveway and sidewalk before the city comes around and gives me a ticket. 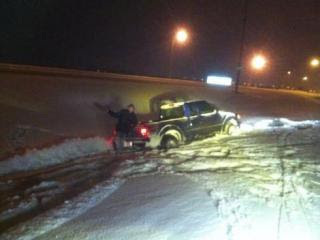 Oh the life of living here in Alberta. All those living in hot and sunny places, enjoy the sun, and don't complain, everyone else, try and get through your day safely. YIKES!!! I just did the conversion for -28C and you are right. Brrrrr is correct. For us Americans, -28C is -18F! I've only seen that cold temperature a few times and never this early in the season. Stay warm, Stampin' Sistah!